Make your way to the designated meeting location and find your guide, before changing clothes and leaving your belongings at a nearby bathhouse. After getting warmed up, let’s kick off your 2-hour running tour! The guide will carry your water bottles to ensure your comfortable running experience. Your tour starts in Ueno, a town that still retains an old-town feel. You will run across Ueno Station and head to Ueno Park, one of the most famous parks in Japan. After enjoying a leisurely jog through the city park surrounded by abundant shrubs, trees and flowers, you are going to run through the grounds of Tokyo University, Japan’s top university with nearly 150 years of history. As you head south to your next destination the Imperial Palace, you’ll be passing through some interesting towns such as Ochanomizu, lined with music instrument stores and record shops, as well as Jinbocho, a veritable heaven for book lovers. 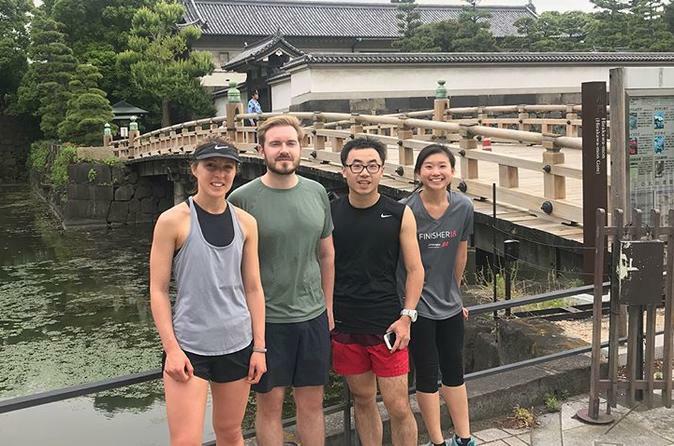 After getting to the Imperial Palace, “the holy place” for Tokyo runners, enjoy going around its moat alongside many other runners while taking in the gorgeous views of the palace. Then the tour heads back to the starting point. On your way back, you’ll be running along streets of Akihabara, a mecca for otaku and tech lovers. When the running session finishes, refresh your tired body by soaking in a hot bath at sento, a traditional Japanese-style bathhouse. After that, let’s enjoy fine food and drinks at an izakaya pub to top off this wonderful experience. If you like hiking in the mountain, I provide this experience too.